Dubbed the Oscars of fashion, the Met Gala produces its share of memorable moments each year, from elaborately themed dresses to bathroom selfies. This year’s gala theme is “Heavenly Bodies: Fashion and the Catholic Imagination.” The exhibition will explore fashion’s relationship with the Catholic church and features designs from Coco Chanel, John Galliano, and Cristóbal Balenciaga, alongside 40 pieces on loan from the Vatican. In honor of the 2018 Met Gala Monday, we look back at five of our favorite fashion memories from Met Galas past. At her first-ever Met Gala in 2006, Sarah Jessica Parker stunned in a custom Alexander McQueen tartan dress that perfectly matched the “Tradition and Transgression in British Fashion” theme. 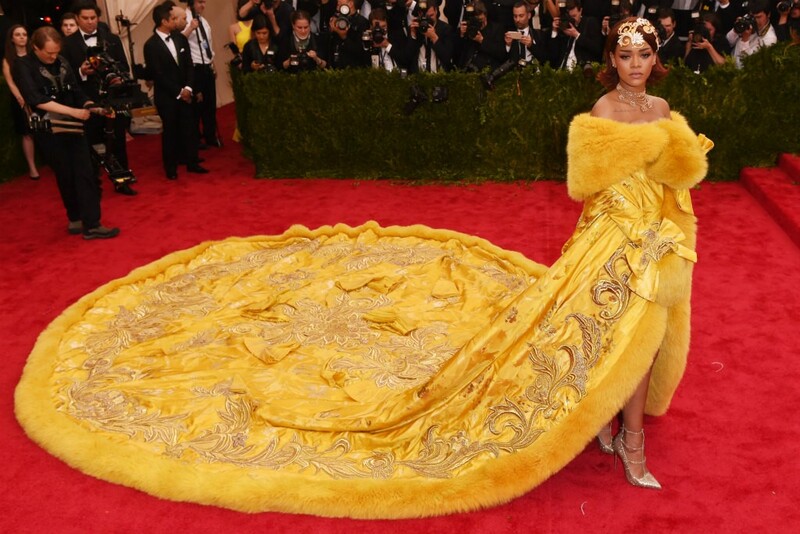 Like Parker, Rihanna is one to follow a dress code, and she embraced 2015’s “China: Through the Looking Glass” theme in a big way. The star — who co-chairs this year’s event — shined in a dramatic yellow satin, fur-trimmed Guo Pei dress with a never-ending train. With her blonde hair and blue eyes, Claire Danes would resemble Cinderella in any ensemble, so it’s no surprise that the star was compared to the Disney princess when she stepped out in a powder blue Zac Posen ballgown. But the classic dress came with a memorable twist: It glowed in the dark. Blake Lively is known for her glamorous red carpet style, and her old-Hollywood-inspired look at the 2014 Met Gala did not disappoint. The “Gossip Girl” star turned heads in an elegant blush-colored Gucci gown with a plunging neckline, paired with burgundy jewelry. Nearly naked dresses are a recurring theme at the Met Gala, but Beyoncé’s 2015 look may be one of the most memorable. The “Love on Top” singer stunned in a sheer bejeweled Givenchy dress that left little to the imagination, which she paired with beige ankle-strap pumps for a bold red carpet look.